Built in 1926 at a cost of nearly half a million dollars, Birmingham's Legion Field served as the site of many memories made in the "Football Capital of the South." Both Auburn University and arch rival Alabama periodically called Legion Field home, and faced each other at the stadium in their annual "Iron Bowl." 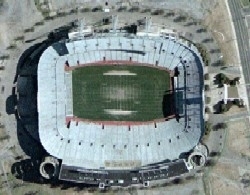 Legion Field would also serve as the home of two different collegiate bowl games: the Dixie Bowl of 1947-48 and the Hall of Fame Classic, later the All-American Bowl, from 1977 to 1990. With a seating capacity which grew to 71,594 later, Legion Field has played host to more pro football teams than any other facility in North America. In 1974 the Birmingham Americans and the World Football League began play in the facility. By 1975 the Americans were gone, but had been replaced by a new team in the same league, the Birmingham Vulcans. In 1979 the American Football Association launched with Birmingham represented by the Alabama Vulcans. Most notably, the USFL's Birmingham Stallions competed at Legion Field from 1983 to 1985. The World League of American Football brought spring football back to Birmingham for two years with the Birmingham Fire. The Canadian Football League moved south in 1995, launching the Birmingham Barracudas for a single season, and finally Vince McMahon's XFL came to town with the Birmingham Thunderbolts playing a one-and-done in 2001.